I love my outfit today. 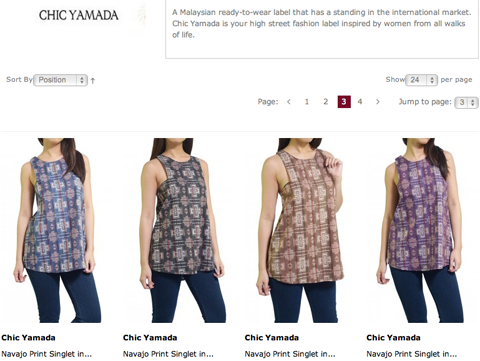 Matching top and bottom from Chic Yamada. Comes in 4 colours! So hard to choose, sigh. Vivy dearie, I hope the Navajo print out/design of this outfit does not bring up any controversy to you or FV. hi vivy. this is my honest opinion. you look like you are wearing pyjamas. imho, it’s best to stick to one printed item at a time. yes i know you are stylish and pretty and have the perfect figure that you can basically wear anything and everything under the sun and yet still look fab but this ensemble, i think it doesn’t work out for you.ni am sure my honest opinion will get bashing from your beloved fans. Dear Vivy, I love to see you in this stylish outfit but when I look twice, I saw many “crosses” wrapped around your body. I don’t know whether you notice it but there might be people who are sensitive with this.. It looks like what very very old chinese aunty would wear.